Then there are the inevitable comparisons with his predecessor. If Paxman was an attack dog, then Davis is more of a wolf in sheep’s clothing – or, as some tabloids point out, the kind of clothing that you might find down your local bar on a Saturday night (the subtext being that Davis is – shock horror! – gay). He has been photographed in low-slung jeans and skin-tight T-shirts that show a flash of tattoo and hint at rumoured intimate piercings. But while this is all great fun – can you imagine John Humphrys wearing trousers so low they showed off his boxer shorts? – I am not quite sure what it’s got to do with his ability to grill a politician. It’s not as if he’s going to front his first show in a pair of leather chaps with a riding crop. Today, Davis is wearing a cardigan and jeans – he looks like a cool, metrosexual geography teacher, if such a thing exists. 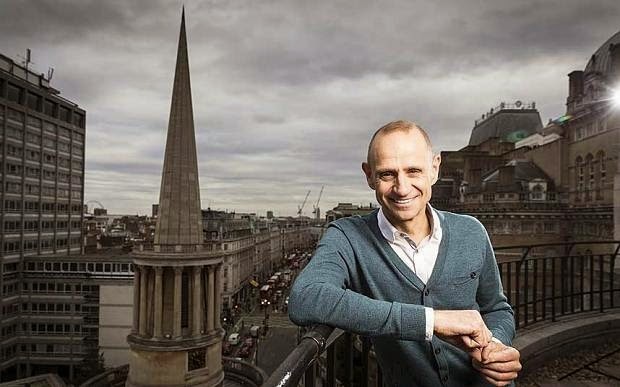 Evan Davis: Right Wing Gay! You're not denying it though, are ya! There's a lot of right wing Ritas at the BBC. Nick Goggley-eyes Robinson is an udder.